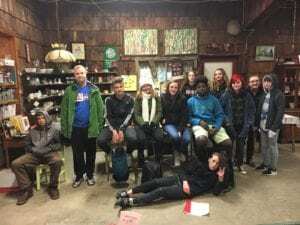 Recently, New Lebanon Jr/Sr High School students in the Intro to Business and University Business classes visited Goold Orchard to learn about various aspects of the Goold family farm business. Students learned about the historical farm which has been in business for over a century. The wholesale and retail sides of their products which include around 13,000 apple trees, their award-winning winery and old fashion cider mill. The marketing strategies students learned included the unique interstate wine trail in which the orchard is the first stop in over a dozen participating farms on the trail. In addition, they learned about what goes into organizing the yearly apple fest which draws up to 22,000 customers and is the second largest event within Rensselaer County. Lastly, students gained further understanding of how the different factors of production were used to produce their award-winning beverages and donuts which mentioned their current natural shared resources and career/job opportunities. There was even an excellent breakdown, scientifically, of how their wine was made within their facilities. The cider donuts and fresh apple cider were enjoyed by all!